The Kirk PZ-128 Arca-Type Compact Quick Release Plate is an ultra-compact and lightweight quick release plate that is custom designed to snugly fit a Canon EOS 5D MK II. Machined from 6061T6 industrial strength aluminum, it uses a weight-saving hollowed-out design. It also features an anti-twist lip that prevents the camera from rotating, especially during vertical shots. This plate follows the industry-standard Arca-Swiss design, which also makes it compatible with quick release components from other manufacturers such as Arca-Swiss, Acratech, Foba, Graf/Studioball, Novoflex, and Wimberley. Box Dimensions (LxWxH) 5.0 x 3.11 x 0.04"
PZ-128 Arca-Type Compact Quick Release Plate is rated 4.7 out of 5 by 9. Rated 4 out of 5 by LooksGood! from Well Build - A Little Big This is a good plate that I had bought because I needed a Arca compatible plate with a loop for a handstrap. This plate was much bulkier than the plate I had from Acratech, but I needed the loop. However; as hard as I tried I could not get the handstrap comfortable, functional, and still have the mobility in my hand to reach all the buttone I needed... so my dream of have a handstrap on my digital camera like my film camera died. That meant this plate was removed and the Acratech plate was returned to the camera. Over all though this appears to be a very solid plate. Rated 5 out of 5 by David S. from Precision anti-rotation QR plate This is a must-have tripod accessory for the Canon 5D MkII. If you've ever struggled with over-torqued QR plates, you'll never have that problem again with this product. Particularly precise fit with Kirk ballheads or monopod heads with their Arca-Swiss type QR system. The 3 inch length of the plate is very useful for precise camera positioning. Highly recommended. Rated 5 out of 5 by Photo Enthusiast from A Nice Camera Plate! This is a very nice camera plate, it is specially designed for Canon 5d Mark II, which perfectly match the DSLR. On the other hand, it also fit the Arca type Ballhead very well. It is slightly wider that the default space on the ballhead, so you may need to adjust the ballhead before use, however, this does not prevent it from being a perfect camera plate. Rated 4 out of 5 by Juan from Perfect Fit Good design, nice finish, made in USA. An expensive camera deserves the security this plate offers. Rated 5 out of 5 by Sarah f. from Solid and finished Fits my 5D perfectly and fits into QR like a hand in a glove. Nice finish. Very solid. Rated 5 out of 5 by FKviper from for 5dmk2 Solid, fits the 5dmk2 like a glove, no woble or rotation. Rated 5 out of 5 by 1holegrouper from Solid Fits as if it is part of the original Body. 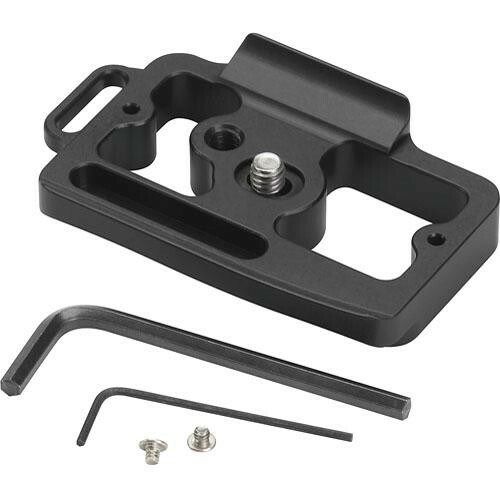 I have an Oben RP-20 tripod, and I want an anti-twist quick release plate for it that will fit my Canon 5D Mark II camera.I see that this will fit the camera. Will it fit the standard head on the Oben without compromising the quick release function? Yes, the Kirk PZ-128 will fit on an Oben tripod without compromising the quick release. Will this work with Canon 5D Mark II battery grip? If you have the BG-E6 battery grip on the 5D II, you would want to go with the Kirk PZ-129 plate (B&amp;H # KIPZ129).